Koka Ninja village gave me the opportunity to become superhuman for a day. I underwent ninja training and afterwards received a certificate for all my failed and successful efforts. Once you arrive at Koka station, there is a free shuttle bus to Koka Ninja Village. When paying to exit, mention where you’re going to the ticket attendant on duty, and he will place a call to Koka Ninja Village. After exiting, the free shuttle bus, you are led to the reception where you pay an admission fee of 1,030 Yen. Afterwards you can don your ninja costumes for only 1000 yen including the deposit. 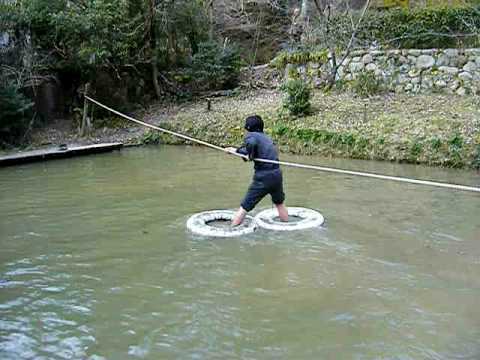 The first place I went was the Mizugumo Water Spider Pond, where we could walk on water. I failed several times, only to see Japanese elementary school kids succeed with flare. The aim is to place your feet inside the floating rings, onto the piece of wood tied within. Then you walk, using the rope for support. I am assuming authentic ninjas never used the rope, and its existence is for training purposes only. As easy as it sounds, and may look, for me it was quite difficult. At times it felt as if I would unintentionally split because my legs were floating away from each other. Reality check to self, Ninjutsu in 5 minutes, impossible. The second place, I went to was the Ninja House, built in 1842. We were given a lot of useful information in Japanese. Due to my handicapped knowledge of the language, I understood nothing. However, we did understand gestures and got to crawl in a hole that allowed us to jump from behind a hung scroll in another room. There was also an escape hatch below a hearth. Close by is a well with an escape route. Afterwards, we decided to throw shurikens at the Dojo for 300 yen. We were given 6 shurikens, which were heavier than anticipated. So instead of using my palm to slide off one by one like a superb ninja, I opted to do one at a time. We were taught how to correctly hold the throwing star. However, that knowledge left pretty quickly and my shurikens fell pathetically to the ground when they weren`t attempting murder on the shuriken trainer. I hit no targets, and when I did the shuriken simply slapped it without penetration and fell. Reality check to self Ninjitsu mastery in 1 day, impossible. Soon we were off to explore the other areas of training. This involved: swinging on a rope, rock climbing, wall climbing, jumping off a low roof, and scaling a wall (literally walking on edge). I fell off the rope. I couldn`t scale the wall past the center, and I was too scared to jump off the low roof. However, I did succeed in rock climbing and wall climbing after lots of verbal encouragement from onlookers and a friend. After realizing being a ninja was near impossible, we went to the Ninja Museum. Everything was in Japanese, but that just made it more intriguing. The museum displayed the language of the ninja, which is Japanese made even more complicated. It shows how, the ninja used the diluted pupil of the cat`s eye to tell time. It also includes: weapons, armory, documents and dress. The museum itself seemed in desperate need of upkeep which isn`t surprising. It is after all, the least used. All in All, Koka Ninja Village was an eye-opening adventure. I got the opportunity to try being a Ninja for one day.